Research shows more than one-third of participants in a 2013 study published in The Journal of Headache and Pain developed migraines they believed were brought on by exercise. These usually lasted from 5 minutes to up to 48 hours after the exercise, and occurred more often in hot weather or at high altitudes. Medical science isn’t clear on why exercise causes migraines in some patients, but a number of theories exist about the question. One suggests the cause could be pressure after exertion that travels from the chest to the brain, using the network of veins as a route. Scientists call this a Valsalva maneuver, and it’s also known as internal jugular vein valve incompetence or IJVVI. It usually happens when the patient holds their breath during exercise—either accidentally or deliberately—which creates pressure in the chest. Working out without a proper warm up, which forces your body to suddenly increase its demand for oxygen, according to the Mayo Clinic. Incorrect (or insufficient) food intake that causes blood glucose to drop. Doing strenuous “new” exercises, which can leave you feeling stiff and sore and trigger an episode. Sweating without replacing enough fluids that can cause dehydration. Receiving a minor blow to the head or neck area, which can cause immediate migraine aura. All this flies in the face of common theory that says exercise actually can provide relief for migraine sufferers, by influencing the patient’s response to the pain. Since the last thing many migraine patients need is to have their condition interfere with their overall physical fitness activities, it’s essential for sufferers to understand how to approach exercising to avoid triggering a headache. Exercise has also been proven to be able to reduce migraines, however, as shown by a 2011 study of 91 people published by the International Headache Society. Participants who exercised for 40 minutes three times a week reduced the number of migraines they developed, compared with those who took part in a relaxation program. The results were also better for those who exercised than for the patients who took a daily preventive medication. Stress is a primary trigger for many patients, so avoid doing any exercises you don’t enjoy or that make you feel stressed out. Skip the bench press if it’s becoming too competitive, and if you’re into athletics where it’s a cut-throat environment you might be better off finding a new activity. Also, since the release of endorphins is believed to be beneficial for migraines, doing activities you enjoy will make you happier, and that could be better for you than any migraine medication. avoid stiffness and sore muscles after the fact. Afterward, take the time you need to cool down before heading back into your daily life. 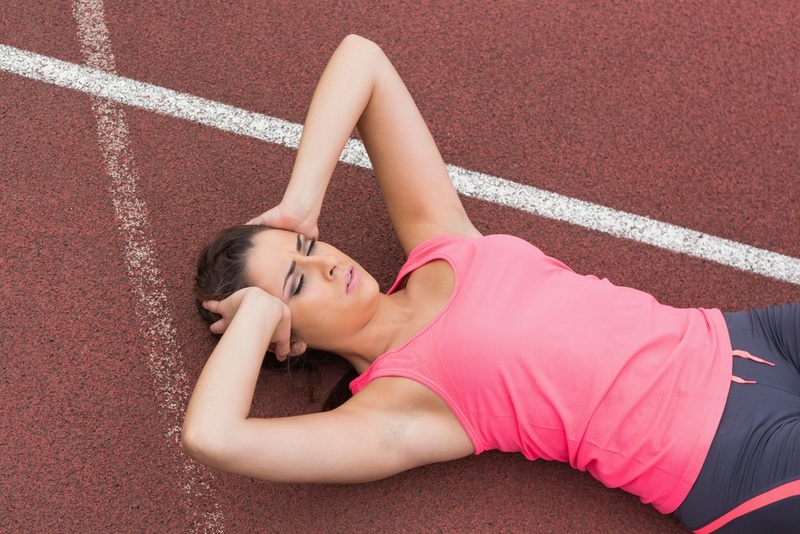 Remember, both starting and stopping strenuous activity can act as a shock to your system, so take it slowly. You might remember a time when you could do almost anything, but—like most of us—those days are gone. For migraine sufferers, treating yourself gently needs to become a way of life, and that includes impacting the type of exercise you choose. Weightlifting appears to be more likely to cause headaches because it causes dilation of the blood vessels in your brain, according to the American Migraine Foundation, so look for something less likely to affect you. Eat moderately an hour or two before working out to make sure your blood glucose levels are stable, and plan to have a full meal an hour after your session to help raise them back to normal. Sip water throughout the duration of your exercise period to avoid getting dehydrated without realizing it, and continue to do so after the session. If you’re drinking the right amount of water on a daily basis, you’ll be less likely to hit a downward slope as a result of exercising. If you discover you’re a candidate for exercise headaches in spite of following all these precautions, it might help you to take some over-the-counter medication before you start. Try an NSAID in advance of exercising, as well as a glucose tablet if you have reason to believe a drop in blood sugar could be responsible. Both of those factors apply to migraineurs who like to do physical exercise. Whatever activities you’re doing, following a regular routine will help your body and brain to adapt, reducing shock to your system as a result. Maintaining a detailed migraine diary that includes how you feel before and after exercising, what you eat and drink, the weather and other potential triggers, can provide your doctor with helpful data to use in planning your treatment program. Various fitness experts recommend people do at least 150 minutes of exercise every week. Typically, non-migraineurs break this down into around five periods of 30 minutes each. If that’s too much for you, 10 minutes of exercise three times a day will also enable you to meet the goal. For migraine patients, the format of a fitness program is also important. This should include exercises aimed at increasing your cardio-respiratory endurance through activities such as walking, jogging, cycling, and swimming. These are a great way to start slowly, and as you build up endurance and strength you can consider running, rowing, and skiing. Few exercises beat weight-lifting for enhancing muscular strength, as long as you begin with small weights or weight machines on a low setting. Improve your flexibility with yoga or Pilates, and build up your endurance with calisthenics. Whatever you do, record how you feel before you begin, what activities you do and for how long, and make note of how you feel afterward. Having regular exercise as a part of your life doesn’t have to be a cause for concern. Focus on establishing what you can do and how it affects your migraine episodes, and identify beneficial activities to include in your fitness program.